Abyssinia, the latest album from Worcestershire musician, Gary Tolley, AKA Garrington T Jones, AKA Gazza Tee, is a collection of nine original songs, one cover and one with a guest singer, masterfully put together to present a compendium of blues, rock, country and new-wave tunes. Taken individually, each song is good enough to stand on its own merits. Collectively, they sit together to form an album that defies any attempt to force it into a genre pigeon-hole. As you journey through the album it becomes apparent that many of the songs reflect and are inspired by Garrington T Jones’ ongoing love affair with Australia, her landscape, people and culture. Road Cases – Inspired by a conversation with an extremely well-read roadie in a bar in Cairns, Australia, Road Cases gives us the thoughts of a rock and roll backstage hero travelling between shows, and opens with a suitably rock and roll count down to a foot-tapping drum beat and catchy guitar riff. Mr Jones tells this tale with a mellow, assured voice that reminds this reviewer of 70’s crooner, Mat Monro. This is a good thing. I Once Had a Girl – The tempo continues with this retrospective love song, a sparky, upbeat tune in the manner of 80’s New Wave Aussie band ‘Men at Work’. Chasing Feathers – This catchy instrumental, inspired by two kittens gambolling outside for the first time, has a feel of something you might find on an early Joe Walsh album. Time – A beautiful, thoughtful song co-written with, and sung by Laura Smith. Time flows like a lazy river on a summer evening and makes you feel better for having listened to it. One of the high points of the album. Blue Car Blues – Another album high point is Tone Tanner’s Hendrix-esque guitar intro to this barmy 12-bar blues about a Nissan Almera SUV. No attempt at a written description will ever do this song justice. You HAVE to hear it to appreciate it. Drivin’ Home With The Blues – More Antipodean inspiration with this ode to “Drivin’ Home With The Blues‘ a weekly radio show from Cairns, Queensland, Australia hosted superbly by Irene R. Barrett. A foot-tapping gem that captures that early Friday Night Feeling. Dust Pneumonia Blues – Anyone who covers a Woodie Guthrie song is alright by me. And Garrington’s version of Dust Pneumonia Blues is a rip-roaring, barnstormer of a tune. Ain’t Workin’ No More – A lazy, wistful 12-bar blues about stepping out of the rat race and the joy of no longer having to work for “the man”. Ride – The intro sound effect of a Harley Davidson at full chat sets the tone for this high-octane journey on two wheels along the Great Barrier Reef Drive. Marvellous. Jacaranda Blue – The perfect final song for any album is one that leaves the listener feeling good, and inspires them to play the album again, and again. This is the perfect final song, and in my opinion the masterpiece of the album. Garrington T Jones’ voice soars over a subtle music arrangement that somehow finds its way into the soul of the listener (any listener with a soul, that is). 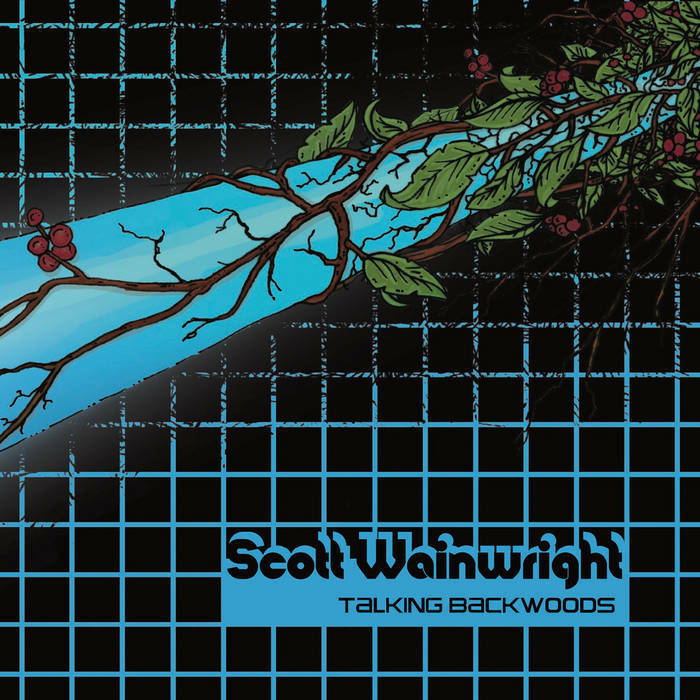 Talking Backwoods by Scott Wainwright, is one of the most unique and original albums that I’ve heard for a long time. I first became aware of it via a recommendation by Andrew (Half Deaf Clatch) McLatchie – a friend and musician with a growing reputation for his own unique music creations. With such an endorsement I felt I couldn’t go wrong, so I bought it. And I’m glad that I did! The album is listed on iTunes as ‘blues’, and for the first minute or so, I thought I was in familiar territory as the first track ‘Remember the Zoo’ opened with an Old School, trance-inducing, foot-tappin’, ragtime finger picking tune that brought a smile to my face. And then, at just after a minute, the synthesiser kicks in. Yep, that’s right. A synthesiser. Beginning with an ominous low-frequency throbbing in the background as a counterpoint to the fingerpicking melody, joined soon after by a playful higher frequency, whistling and whooping through the tune without a care in the world. “This is different,” I thought. Track two is Backwoods Progress Blues, and this begins with a sound effect that provides echoes of Pink Floyd (no pun intended), sounding very much like the intro to ‘Wish You Were Here’. The track comprises a dirty blues harp riff to a foot-stomping backbeat, and once again enhanced by the addition of electronica and further sound effects. Track three, Refuge of Hope, is a mellow, so-chilled-it’s-frosty, introspective guitar-based composition that showcases the skill and virtuosity of Mr Wainwright. Track four is Delta Surfin’, which opens with Early Floyd-esque effects dancing back and forth between speakers/headphones, followed by a prelude of flamenco guitar leading into a meaty resonator-sounding riff of slides and arpeggios to a backdrop of synthesisers and ending with a delicious one-fret slide. Track five, Eleanor’s Dance, is a folky, fingerstyle guitar rag in the manner of Mississippi John Hurt, and, as with the previous tracks, enhanced by the addition of synthesisers which take the frivolity of the tune, albeit briefly, to a darker place. When the track ended, I replayed it because the final half-minute or so had made me re-evaluate the whole tune, and in fact the whole album (I write this after countless play-throughs, but more of that later. Track six, Better Days, my favourite of the album, is a rollicking jam session of a tune, of the kind that occurs when a group of talented musicians get together and collectively get into “the zone”. Better Days made me smile from the outset and twist the volume button up to ‘11’. This happens each time I listen to it. Oh, and by the way, if you want to hear musical perfection, it occurs precisely at 1:42, just after the bass riff. Track seven is another contemplative tune called Before the Battle, After the War, and as the name suggests it’s a tune of two halves. Lazy slide riffs alongside an acoustic rhythm guitar to the backdrop of birdsong lulls the listener into a false sense of serenity and then jolts them awake with a change of pace and instruments that ends abruptly before you realise what’s happened. In my opinion, an understated work of unsettling genius. Eight is ‘Mellow Rag’, a track that in my mind is mash-up of the sound of the old Memphis Jug Bands of the 1920s, and the first Gomez album in 1998. Once again, very subtle. ‘Dolly Johnson’ is track nine, and this is a delightful little ditty that wouldn’t be out of place being performed on the front porch of a shack in the Appalachian Mountains, complete with clog dancer. Marvellous stuff. Track ten is ‘The Distance Between Us’, a reflective Spanish Guitar-themed piece that drips with the angst and emotion that the title hints at. Heartbreaking. Eleven is ‘Leo’s Greenhouse’, another foot-tapper similar in theme to ‘Remember the Zoo’ and full of synth, drum machine and hand-clapping goodness. At the end is ‘At The End’, a playful tune that maintains the quality and virtuosity of the tracks preceding and ends the album on a high note. Any instrumental piece that makes you stop and think about its very meaning is a very rare beast. Scott Wainwright has created and entire album of such pieces and in doing so has taken the blues into new territory by adding electronica which gives a mellow trance vibe. Trilby-bedecked blues purists will hate it. The sour-faced blues police, by that I mean those who sneer at anyone who didn’t meet Blind Lemon Pegleg in 1967, will also hate it. That’s a good thing because it will get people talking, and the more people that talk about the blues, the more the blues will be kept fresh. Furthermore, I think if the likes of Blind Blake and Mississippi John Hurt were alive today, this is what they would be playing. This marriage of blues and electronica, in a collection of instrumentals, is a bold move. But I think it’s paid off. I think Talking Backwoods is a masterpiece, and exactly the direction that blues need to travel. At long last, my debut novel has finally hit the streets (of Amazon) and is now available on a Kindle near you. A chance remark at the end of a beer-fuelled evening in Clarksdale in February 2012 has resulted in Fat Man Blues – the story of Hobo John, a white blues enthusiast from England, who meets the mysterious Fat Man in bar in present day Clarksdale, Mississippi. Fat Man offers Hobo John the chance to travel the Mississippi delta at the time of the “real” blues of the 1930s – the time when Charley Patton, Robert Johnson et al were the One Direction of their time. For Hobo John, this is an offer he really can’t refuse and along the way he gets to listen to and play the music he loves in the land that he has always dreamed of visiting. However, he soon encounters to the harsh reality of life in the delta and the horrific consequences of the deal he has made. Writing this has been a labour of love. Love for scratchy old blues music and the history of the blues singers who ultimately helped change the face of popular music, made a lot of (mostly white) people very rich but earned very little for their efforts, often living forgotten, impoverished lives and dying in squalor. If you’re reading this and don’t know the first thing about Mississippi Delta Blues, then I recommend (nay, urge) you to research the music. Fat Man Blues contains references to a whole bunch of songs and artists, some of which are listed below. This was playing in Red’s Lounge when Hobo John walks in and meets Fat Man for the first time. Anyone who listens to this and doesn’t move to it is probably dead. A classic by Memphis Minnie and played here by the excellent East River String Band from NYC. Beautiful song by Mr Patton, who tells us he’s “going’ where the southern cross the dog”. This is a ragtime standard played by the guy who taught me to play slide guitar. I’m still light years from having his “chops” but it sounds great on my steel resonator. Originally recorded by Son House, there are a million different versions. Tommy Johnson was (in my opinion) a rather underrated singer, who lived in the shadow of his namesake but produced some rather splendid music. Canned Heat refers to Sterno, a fuel made from denatured and jellied alcohol and burned directly from its can. During prohibition, the alcohol would be squeezed through cloth and mixed with fruit juice or drunk neat. This tune is from the Mississippi Hill Country and has a different musical sound to traditional Delta blues. This is a tune I’ve been trying to master, and played right it has a hypnotic, almost trance-inducing sound. Two songs that capture the “sound” of Son House. My Black Mama formed the basis of his later tune “Death Letter Blues” – played here by Son House in the 1960s. “Gonna get me religion, gonna join the Baptist Church / If I was a Baptist preacher, I wouldn’t have to work…” – says it all, really. “I’m going’ away, to a world unknown, you know I’m worried now, but I won’t be worried long…” Listen carefully and you’ll hear Mr Patton slapping his guitar as he’s playing. I never get tired of hearing this. Finally, a friend of mine, Mr Andy Peters has written and recorded a song in celebration of Fat Man Blues. Not only that, he’s also created this video. For once, I’m speechless. Thanks Andy. 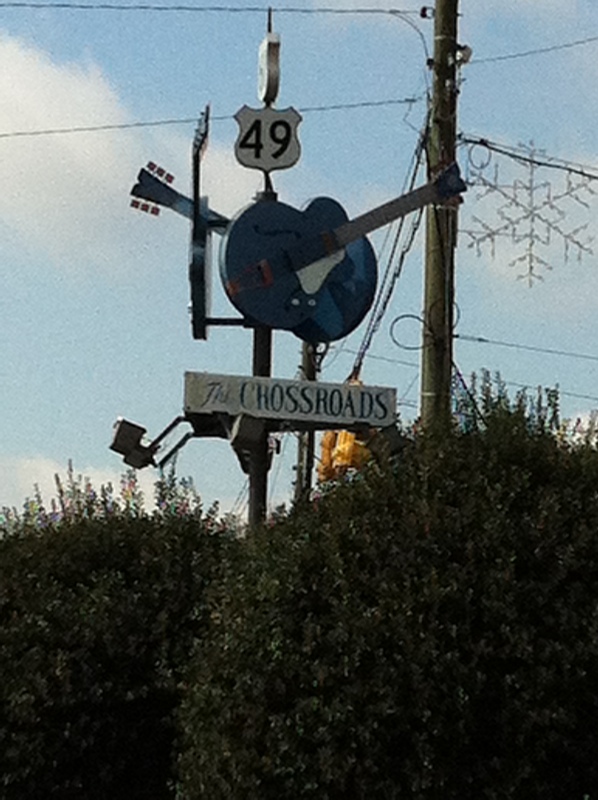 Day 3 of NaPoWriMo and it’s back to the blues with these two poems: The first one (which I wrote today) is inspired by memories of Clarksdale and the monument to the legend of Robert Johnson making a deal at a crossroads. Whether you believe it or not, it’s a definitive blues story that I think is let down a little by what has been erected at the intersection of Highways 61 and 49. Today’s poem was inspired by Andrew Peters, a fellow blues fan, occasional sparring partner on Twitter and general antidote to social media. Andy is the author of a series of novels featuring the “Blues Detective” – a Welsh private investigator living in Memphis – and other works including my personal favourite, “Joe Soap”. Check out his work, you won’t be disappointed. The assertion of a Sage?